The Duke of a Thousand Desires is Book Fifteen in The Boscastle Series. The connecting novels are all available in print and e-book. Simon Caverley, the Duke of Rochecliffe, was Lady Ravenna Boscastle’s best friend. Now, years later at a Mayfair party he becomes her heart’s nemesis, enigmatic, sophisticated, and dangerous. He is the one man in London she has been warned to avoid… the eligible duke countless women hope to capture. Ravenna has no intention of falling for his dark charisma. She’s too busy plotting to break her engagement to the fiancé who has betrayed her. All goes according to plan—until Simon blithely walks into a deadly trap instead of a rendezvous and she is compelled to save the irresistible scoundrel’s life. Caught with Simon in a shocking position, Ravenna must choose between banishment or betrothal to the scandalous duke. Marrying Ravenna is no sacrifice for Simon. She’s the only lady he has ever truly desired—or been denied. Wed in haste, they soon find their friendship deepening into a passionate alliance. 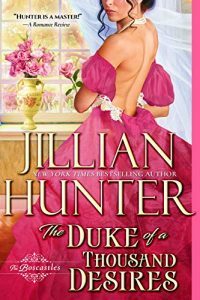 Still, a happy ending eludes the lovers until the duke confesses his most intimate secrets to his wife and confronts the enemy who has schemed to destroy him.